An adventure to Aspen, Colorado isn’t complete without a visit to its main attraction. The Maroon Bells, a series of distinctively bell-shaped, wine-colored peaks towering 14,000 feet above the pristine, glacial Maroon Valley, remain the most photographed mountains in North America and offer some of the most spectacular natural views in the world. From meadows of vibrant wildflowers to airy groves of Aspen trees to summit-based alpine tundra, the Maroon Bells promise a variety of natural habitats and a diverse, vivid representation of the wild Rocky Mountain range. With six scenic hiking trails, various camping sites, and biking paths fit for all skill levels, visitors can enjoy multiple ways to access Aspen’s natural marvels and endless mountain adventure perfect for any season. Explore Aspen’s Maroon Bells, and discover how a journey through over 300 million years of jagged stone inspires travelers from around the world to defy ordinary. Enjoy our 360 Virtual Tour while you plan your in-person visit. The road is currently CLOSED for the winter & spring seasons as of 11/1. Due to avalanches crossing the road leaving boulder & tree debris, the road to Maroon Bells will have a delayed summer opening date. From June 15 to October 6, between the hours of 8am and 5pm, the Maroon Bells can only be accessed by public bus. The Maroon Bells are approximately 10 miles from downtown Aspen, 8 miles from the Aspen Highlands Visitor Center, and 5 miles from the Forest Service gate on Maroon Creek Road. The Maroon Bells bus runs between the hours of 8am and 5pm and can be accessed at Aspen Highlands which is just 2 miles up Maroon Creek Road on the left-hand side. There is limited parking available at Aspen Highlands for $5 per vehicle on the weekdays (0-3hours, $10 for 3-8 hours and $20 for full day) and $10 weekends (0-3 hours, $15 for 3-8 hours, $25 full day). Purchase bus tickets for $8 inside of Four Mountain Sports or the ticket office. Tickets are also available in town at the Rubey Park Transportation Center. You may also purchase a Perfect Summer Pass from the Aspen Skiing Company which combines the cost of a Gondola Ticket + Maroon Bells bus ticket. Buses depart every 20 minutes. If you don't have your own car you can also take the Castle/Maroon RFTA bus from Rubey Park Transportation Center in downtown Aspen. This bus is FREE and departs every 20 minutes starting on the hour. Take the Castle/Maroon bus to Aspen Highlands and then transfer to the Maroon Bells Bus. When bus service is available motorized travel on Maroon Creek road is limited to vehicles carrying persons with disabilities, children under 2 years of age in car seats, and campers occupying Silver Bar, Silver Bell, and Silver Queen Campground. Should you choose to drive your own car before 8am and after 5pm, please be prepared to pay a $10 per vehicle fee. CASH OR CHECK ONLY. Take Maroon Creek Road from the roundabout on HWY 82 just outside of Aspen heading west. If you drive up to the Bells prior to 8am you will be able to use your car on the road to return to town. Once past the Welcome Center, you would not be able to access the Maroon Bells again until after 5pm. In the winter, getting to the Maroon Bells can be quite an adventure. 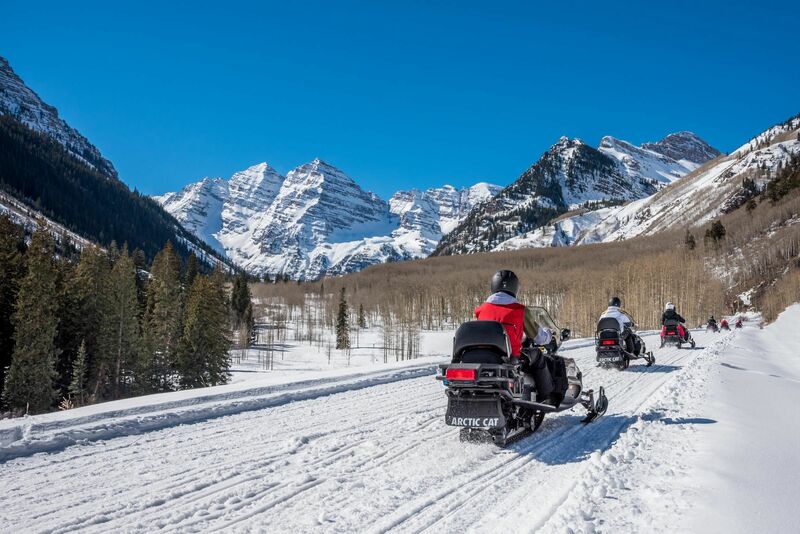 Since Maroon Creek Road is closed to vehicular traffic, the only way to get there is to cross country ski, or go on a snowmobile tour run by T-Lazy 7 Ranch. Either way will be an incredible experience with unparalleled views. 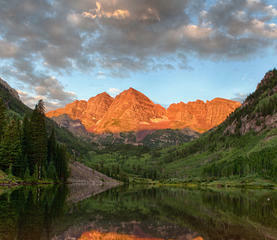 Please note, Maroon Lake and the scenic vista of the Maroon Bells is 5 miles from the road closure gate. Be prepared should you decide to walk. Miles (one way): .75 | Elevation: 9,500 ft. - 10,000 ft. The trail extends around the far side of Maroon Lake and meanders along the creek flowing into the lake. This is a great place for pictures and picnics, and is perfect for all skill types. Miles (one way): 1.8 | Elevation: 9,500 ft. - 10,100 ft. This is the Maroon Bells Hike. The trail begins at Maroon Lake, extending leisurely through an open meadow. The trail then forks, splitting into the Maroon Snowmass Trail and the Maroon Lake Scenic Trail. On the right, the Maroon-Snowmass Trail climbs through the Aspen groves to Crater Lake. To the left, the Maroon Lake Scenic Trail follows a river, crosses two bridges, and then winds upward in a steep climb to merge along the Maroon-Snowmass Trail. Miles (one way): 10.5 | Elevation: 9,000 ft. - 12,000 ft. The East Maroon Trail crosses into the Maroon Bells Snowmass Wilderness. At the top, the East Maroon Trail offers access to Copper Lake and Gothic for further hiking and backpacking. Miles (one way): 6.5 | Elevation: 9,500 ft. - 12,500 ft. The West Maroon Pass extends around Crater Lake on the right side, follows the stream for a short distance, winds through the forest, and then crosses a rock scree field. The trail angles to the right and steadily ascends through willow and then tundra. The trail continues to climb steeply to a long traverse that goes to the top of West Maroon Pass. Miles (one way): 4.6 | Elevation: 9,500 ft. - 12,500 ft.
At Crater Lake, take the right fork, which climbs steadily into Minnehaha Gulch. About 1/2 mile above the tree line is the junction between the Maroon-Snowmass Trail and the Willow Lake Trail. Take the left fork that ascends steeply to the summit of Buckskin Pass. Follow the directions to Crater Lake, and then take the right fork. The trail ascends steeply. About 1/2 mile above the tree line is the junction between the Maroon-Snowmass Trail and the Willow Lake Trail. At the junction, take the right fork. The trail climbs steeply to the top of Willow Pass. From the top of the pass, the trail descends to the junction with East Snowmass trail. Continue straight on the trail for the last 1/2 mile to return to Crater Lake. Aspen’s Maroon Bells and the surrounding environment promise premium views and amazing access to Colorado’s natural wilderness. 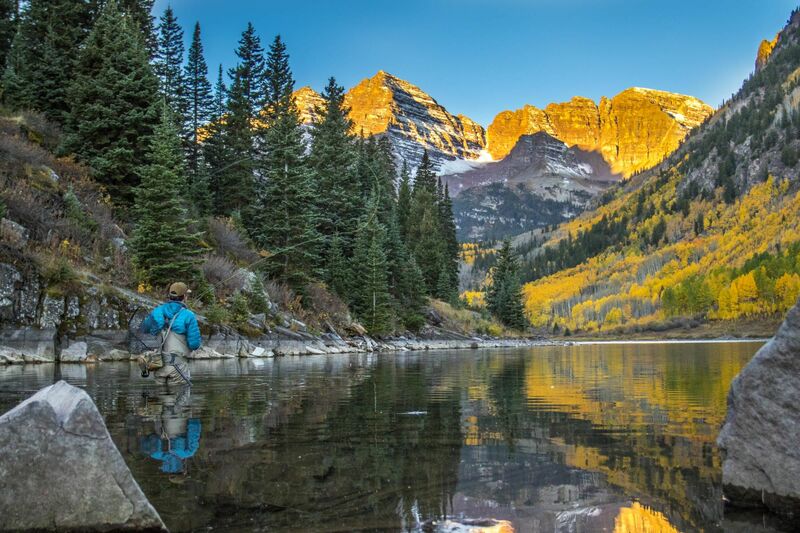 With the incredible golds and deep reds of the mountains’ bright fall foliage, sprawling open meadows, breathtaking lakeside sunrises, and a diverse collection of active, abundant wildlife, the Maroon Bells offers a wealth of opportunity to capture that perfect shot. As with many prized places, in order to get the perfect shot you will need to get there early, very early.